During 2016 and 2017, glassy-winged sharpshooters (GWSS; Homalodisca vitripennis) collected from vineyards with a known history of Pierce’s disease or nearby citrus orchards in Kern County, California were assessed for presence of Xylella fastidiosa by quantitative PCR using total DNA samples extracted from GWSS heads. Conventional PCR products for three X. fastidiosa housekeeping genes (petC, leuA, and holC) were cloned from a subset of X. fastidiosa-positive GWSS DNA samples. Cloned sequences were assigned to X. fastidiosa subspecies based on Single Nucleotide Polymorphism (SNP) signature barcodes (7–12 polymorphic sites per amplicon that differentiate reference genomes of subspecies fastidiosa and multiplex). A total of 2005 clones were sequenced: 1499 (74.8%) were genotyped as subspecies fastidiosa and 491 (24.5%) as subspecies multiplex. Among cloned subspecies fastidiosa sequences, 95.4% had SNP barcodes identical to the corresponding gene present in subspecies fastidiosa strains cultured from Pierce’s disease-affected vines in the same region sampled in 2016 and 2017. Presence of SNP barcodes representing both subspecies in one or more cloned genes was commonly observed within individual GWSS. This observation indicates that populations of X. fastidiosa in some insects consists of two subspecies or of two genotypes of one subspecies in which a proportion of the population was derived from a lineage with a history of horizontal gene transfer and homologous recombination. These conclusions suggest that: 1) individual GWSS may visit multiple host species (inoculum sources); 2) sequential pathogen acquisition events can lead to co-colonization of GWSS; 3) competitive exclusion of X. fastidiosa in the foregut is weak or not operating; and 4) the vector foregut is a potential arena for exchange of genetic material among sympatric X. fastidiosa subspecies. We thank Robert Leija, Sandra Navarro, Brandon Ortega, Sean Uchima and Kunbo Zhang for technical support. Mention of trade names or commercial products in this publication is solely for the purpose of providing specific information and does not constitute endorsement by the U. S. Department of Agriculture. USDA is an equal opportunity provider and employer. This project was supported by funds received from the Consolidated Central Valley Table Grape Pest and Disease Control District and USDA-ARS appropriated project 2034–22000-012-00D. This research article is not submitted elsewhere for publication and complies with the Ethical Rules applicable for this journal. This article does not contain any studies with human participants or vertebrate animals. 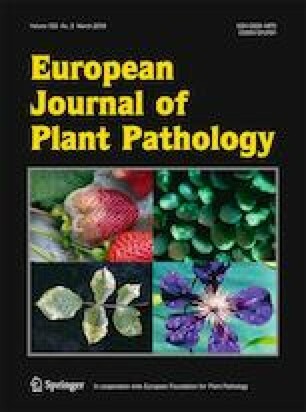 All authors have approved the manuscript and agree to submission to European Journal of Plant Pathology.